Shoppin Lite is a free Windows 8 Shopping Planner app that lets you make multiple shopping lists and manage your budget in an easy way. Using this free Windows 8 Shopping Planner app, you can set your budget, add your planned expenses, and control expenses accordingly. This app is extremely lightweight and possesses a well organised interface to keep track of your shopping plans. You can make multiple shopping lists and add items in various categories. If required, these lists can easily be edited, or deleted anytime. 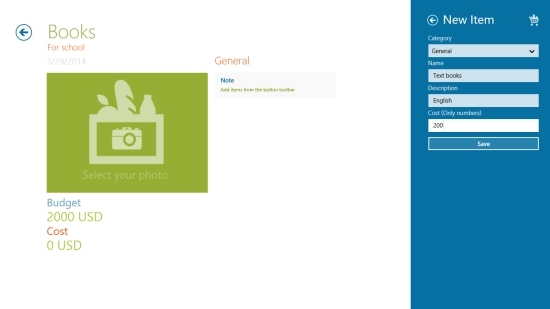 The app also enables you to select a photo from your system and set it on the shopping list tile. 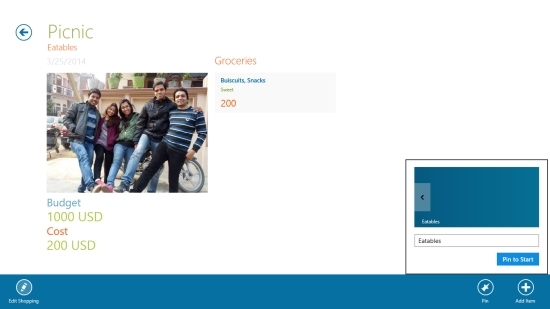 You can even pin a list to your Start screen so that you don’t forget any important shopping. 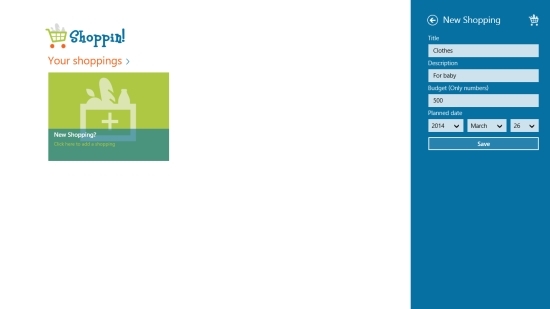 Shoppin Lite is freely available in Shopping category of Windows Store. You can search for the app in Windows Store using Win+Q key combination or view it directly in Windows Store using the link given below at the end. 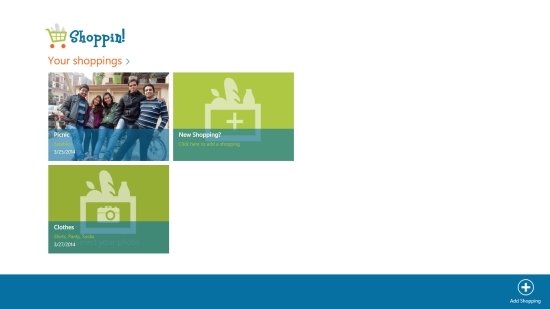 Let’s have a detailed look at this free Windows 8 Shopping Planner app. I must say that the app is very well designed and appropriately serves the purpose. The Start screen of the app looks quite blank initially with just one tile directing you to click on it to create a shopping list. As you click on this tile, a right flyout will appear. Fill all the directed fields including Title, Description, Budget, and Date. Now click on Save button to save this list in the app. You can create multiple shopping lists in the similar way. All you shopping lists will display on the main screen of the app. To add items under various categories in the shopping list, right click on the screen. A bottom flyout will appear displaying options Edit Shopping, Pin, and Add Item. Click on Add Item. A right flyout will appear again. Select a category using the given dropdown, type Name, Description, and Cost. Now click on Save. On left side of the screen, you can always see the assigned budget of the shopping list and how much you have planned. This will help you control your budget. You can always edit or update your shopping lists and items as and when required. To edit your shopping list, right click on the screen and use Edit Shopping option that appears on the bottom flyout. To edit/ update an item in a shopping list, open the list and click on the category. You can save it back in the app after making the required changes. As I mentioned earlier, this app also offers to pin a shopping list to your Start screen. To do so, click on Pin option that appears on the bottom flyout. This will not only remind you of your important shopping, but allow a quick access to the shopping list straight from the Start screen. To delete a shopping list from the main screen, right click on the desired shopping list to select it. Then right click on the app’s screen again. Click on Delete option to delete the desired list. Similar Apps: Shop’List, Zappos, My Cowboy Boots – TNO. Shoppin Lite is a nice Shopping Planner app that not only lets you create multiple shopping lists, but also allows you to control your budget. Pinning to Start screen option makes it convenient and quick to access these shopping lists. Try this app and have a smart shopping experience. Share your feedback via comments.